This post appears as an April 2013 article for MHEA's newsletter, News and Views.You can read Part 1 here. Let’s be honest. Again. High school students can be extremely challenging, particularly when it comes to a subject they do not prefer. As in life, there comes a time in education when we must do what we'd rather not but we can strive to keep it appealing. Let's throw out the poster board and worksheets and get these students engaged in literature! 1. Read the same book as a couple of fellow students (or siblings) and dramatize a favorite scene from the book. Write a script and have several rehearsals before presenting it. A group project allows each student to utilize his particular set of skills and talents. 2. Create a "cube" by including different elements of the novel or nonfiction book on each side. This is particularly effective with biographies or mysteries. A great and free resource can be found here. 3. Keep a diary as the story's main character, including events from the book and/or the character's thoughts and feelings. This project is great for the solitary, creative type. 4. Create a blog based on the novel, including picture, videos, or summaries of the book as well as character sketches and other literary elements. Allow the kinesthetic student to organize this as he or she likes. 5. Create a Cast List for the film version of the book. Discuss what a casting director is and have students make a dream cast list including photos and descriptions of each actor and why each is perfect for the part. This list can include ANY one they'd like, even friends and family. 6. Prepare a meal or dish based on the book or a character from the book. Allow the student to be creative and provide the supplies and gentle supervision necessary. Find more homeschool resources and inspiration here. 8. Write an alternate ending to the novel. This activity allows the introspective student to have creative control as well as exercise writing ability. As high school students tend to enjoy spending time with peers, any activity that can be done in small groups will likely be more valuable to them. Allow them the use of technology or other innovative mediums to complete projects and enhance enjoyment. There is no hard and fast rule preventing schoolwork from being fun, even in the upper grades. What students enjoy, students remember. Heather Jones is a homeschooling mom of 4, including a homeschool graduate. With 3 boys, 1 girl, special needs and every learning style represented in her home, she finds home the most efficient place to educate with passion. 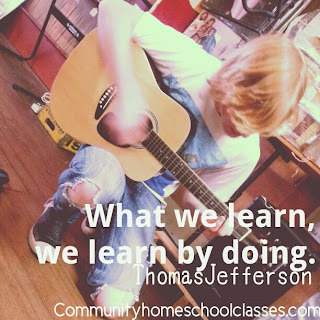 Heather has worked as a graphic designer, a librarian and currently tutors homeschoolers in literature and humanities at Community Homeschool Tutorial.